A half-corpse-woman exhibited on a little wooden platform surrounded by curious voyeurs. People on big swings. A mystified looking audiences. A Punch and Judy show. Human figures reflected on a turbulent watery surface. Lap dissolves that interrupt the timely order of shots. Double exposures that make for a loss of a fixed sense of space. What I am describing is Vienna’s Prater district as reconstructed by Hollywood, two minutes of footage from Josef von Sternberg’s The Case of Lena Smith (1929), a film long thought to be completely lost. But as fate would have it, a four-minute fragment of the film was found in 2003 in China by the Japanese film historian Komatsu Hiroshi – it is all that is left of the film. 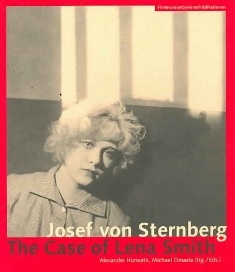 With the aim to reconstruct what is lost through what remains, in 2007 the Austrian Filmmuseum produced the book Josef von Sternberg: The Case of Lena Smith. (1) Edited by Alexander Horwath and Michael Omasta, this English and German bilingual volume assembles around a lost centre – the actual film – an impressive, multilayered array of material: photographs and production stills, international reviews, set-sketches, script and production documents, and a collection of essays by internationally renowned film scholars. The amount of dedication put into Josef von Sternberg: The Case of Lena Smith, a book of 300 pages on a vanished film, can be taken as an archival experiment on historical reconstruction, or, as a tribute that accompanied the Austrian Filmmuseum’s 2007 retrospective on Sternberg (by its own account the most complete held in Europe to date), or, as an effort to draw Sternberg’s biography back to Vienna. Yet it is amazing that it is precisely the Prater scene that was found and thus, from a local point of view, the book helps draw attention to this famous historical area to the north of Vienna’s city centre. In 2005 the publication Prater Kino Welt: Der Wiener Prater und die Geschichte des Kinos, edited by Christian Dewald and Werner Michael Schwarz, oversaw an intensive time of research on the Prater district. (2) The book was accompanied by an exhibition (3), two open public film festivals held in Prater, and a model DVD edition that contains every piece of footage filmed at the Prater from 1900 to the present. (4) This DVD contains material on the Prater that for decades was thought to be lost; footage which, in turn, formed the basis for Ulrike Ottinger’s Prater (2007), a film that not too successfully loosely mixes found footage with new material. The Prater still exists today, and for each attempt at research the challenge is to find what we know is buried down below: a media-archaeological site that for over 100 years seems to have absorbed all narratives that play a role in so-called modern life. Well known are the two Viennese born directors who made their way to Hollywood: Josef von Sternberg (1894-1969) and Erich von Stroheim (1885-1957). In 1909 Sternberg’s family left the Austro-Hungarian Empire and immigrated to America for good. Twenty years later he made The Case of Lena Smith. Yet Sternberg directed two other films set in the city of his birth: The King Steps Out (1936) and Dishonored (1931). Erich von Stroheim, an earlier Austrian émigré director in California, remembered Vienna as well in The Wedding March (1928) and Merry-Go-Round (1923) (5). What the latter works and The Case of Lena Smith have in common is their major set – the Prater, as reproduced in Hollywood. 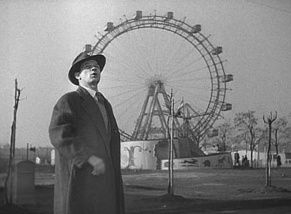 To cinéphiles outside Austria, the Prater is best known for its giant wheel as prominently featured in The Third Man (Carol Reed, 1949). This part of the area, Wurstelprater, is the burlesque end of the Prater, associated with all the crazy fun-park machinery of ghost trains, roller coasters, car races and bird-eye perspectives of the giant Ferris wheel. It is the mocking of baroque forms in the centre of a baroque city, the tamed shocks for the society of the spectacle. Thereafter Prater is not only an amusement park. The larger part of it opens up to Vienna’s widest recreation area, formerly part of the flood meadows used by the emperors as hunting grounds. Its main avenue, called Prater Hauptallee, is today a 4.5 km straight-line alley, but in former days it connected Praterstern and Lusthaus, the Emperor’s lodge. Long used as a boulevard by aristocracy, and the site of the first workers’ demonstration in 1890, it is now a popular Nordic Walking route. Beyond the Prater’s amusement grounds and leisure park is the Praterstern, a major transit hub for multidirectional cross-town traffic. A former small city square, Praterstern (literally meaning “Prater Star”), was rebuilt into a star shape during the 19th century with seven mayor city avenues leading to it. Since the World Fair in the 1870s, the Prater was a ground for scientific representation linked to popular amusement, such as dance clubs next to dioramas or laterna-magica shows. By 1901 institutions like “Salon Moderner Wunder” (“Saloon of Modern Wonders”) were advertising in the Prater, promoting scientific experiments in occultism, psychology, anamnesis and telepathy, experimental physics and somnambulism (7). Since the time of the World Fair at the Prater, the world was to be observed (9) not only thorough high vantage points, and not only by media or illusionist panorama paintings, but also with “actual” objects and “real” humans being collected at one place. War exhibitions (of enemies in Europe and elsewhere) came with expositions of physical abnormities. (10) Links to ethnographic findings resulted in rebuilt replicas of African villages, Japanese garden houses, Turkish coffee shops, a North American wigwam and a Swedish school. The replica frenzy certainly reached its peak with the lavish life size reconstruction of Venetian buildings in “Venedig in Wien” in 1895, even allowing for a whole channel system with bridges and squares. 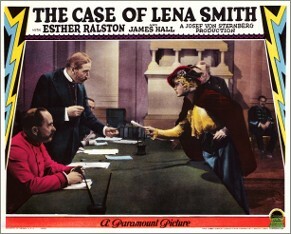 In the second half of the four-minute fragment from The Case of Lena Smith we see Lena (Esther Ralston), the film’s protagonist. She is wearing the traditional Hungarian headscarf that makes her stand out amongst the city audience who are watching a magician perform his trick of the floating virgin. Lena is a country girl from a farming village in the Austrian-Hungarian Empire of 1885. Behind her stands a Warrant Officer from a notable family, Franz Holz (James Hall), smiling nonchalantly. He uses his cigarette to burst Lena’s balloon and arouse her angry attention. When the magician turns to the crowd to choose an audience member to perform his magic on and points to Lena to come on stage, she rushes away. End of the fragment. The meeting of high- and low-brow cultures, of entertainment, representation and spectacle, the pluralistic social character of the Prater has always prompted intellectuals to romanticise the area, as for example, within the literature of Felix Salten and Arthur Schnitzer. (14) Erich von Stroheim, who had left Vienna just a year after Sternberg, remembers its “complicated class-structure that divided the Prater, the great Prater along the Danube, into the Volks Prater – the People’s Park – full of Punch and Judy shows and Ferris wheels, and the Nobel Prater, the park for the upper classes”. (15) Sternberg’s Lena seems to be the typical ancestor of the Viennese of today. At the turn of the 20th century Vienna experienced a mass migration of country workers to the city. Having come in order to look for work, they generally found themselves in subordinate roles to city people, from which arose an image of a population yet unspoilt by mass urban living, a folkloric culture where humour and spontaneity reigned. The Prater becomes the place for the clash of cultures between the city sophisticates and general folk that often found expression in stories of doomed love between members of different classes, as in the case of Sternberg’s Lena Smith and von Stroheim’s Mitzi Schrammell (Fay Wray in The Wedding March) who are seduced by characters above their station. Since then, the city of Vienna, and the Prater in particular, have been rebuilt and refashioned as layers of history endlessly supplant one another. The latest urban planning process on the area rests on the restoration of the Praterstern train station on the one hand, and, a curtain-wall around the amusement park itself. Countryside workers have become regular commuters, traffic systematically outgrows the area. Façades replace former façades, as things are constantly re-historicized. There are many reasons for looking at this world again. Alexander Horwarth and Michael Omasta (Eds), Josef von Sternberg: The Case of Lena Smith, (Vienna: Filmmuseum Synema Publikationen, 2007). Christian Dewald and Werner Michael Schwarz (Eds), Prater Kino Welt: Der Wiener Prater und die Geschichte des Kinos (Vienna: Verlag Filmarchiv Austria, 2005). Prater Kino Welt: Filmvergnügen im alten Prater, Exhibtion at Wiener Pratermuseum, Curated by Dewald and Schwarz, 2005. Der Wiener Prater im Film, Sonderedition Film + Text, DVD, Christian Dewald and Werner Michael Schwarz (Eds), Verlag Filmarchiv Austria, Vienna 2005. The film was begun for Universal Pictures by Erich von Stroheim, but is officially credited to Rupert Julian. For more information see Alexandra Seibel’s “Reflexion am Rummelplatz”, in Prater Kino Welt, p. 279. Taken from research conducted by Thomas Kohlwein for “Stars, anyone?”, 750.002 Bildverlust DVD Edition, Mina Lunzer (Ed. ), Vienna 2009. Dewald and Schwarz, Prater Kino Welt, p. 19. Josef von Sternberg, Fun in a Chinese Laundry, New York 1965. As Quoted by Horwarth in Josef von Sternberg, p. 8. Ursula Storch, “Eine Reise um die Welt – Im Wiener Prater”, Prater Kino Welt, pp. 101-126. Thomas Ballhausen and Günter Krenn, “Dem Schönen ein Heim”, Prater Kino Welt, pp. 265-279. Dewald and Schwarz, “Kino des Übergangs”, Prater Kino Welt, p. 13. Stefan Andriopoulos, “Okkulte und technische Televisionen”, in Stefan Andriopoulos and Bernhard J. Dotzler (Eds. ), 1929. Beiträge zur Archäologie der Medien, Frankfurt/M., Suhrkamp, 2002). A modern form of stylized social realism deriving from kabuki theatre. See further, Komatsu Hiroshi, “The Case of Lena Smith – Ein Fragment”, Josef von Sternberg, p. 243. Michael Cowan, “Kino und Klanglandschaft im Wiener Prater um 1910”, Prater Kino Welt, pp. 203-253. Alexandra Seibel, “Reflexion am Rummelplatz”, Prater Kino Welt, p. 284. Alexander Horwath, “Arbeit mit den Geistern”, Josef von Sternberg, p. 24. Preface of Sternberg’s translation of Carl Adolf’s book Daughters of Vienna, reprinted in an article by Goswin Dörfler Josef von Sternberg, London: British Film Institute, 1980, pp. 10-13. Martina Lunzer is a Vienna born artist and essayist presently living in Berlin whilst completing her Masters degree at the Academy of Fine Arts, Vienna. She is the editor of the DVD study edition “Bildverlust”, part of which is dedicated to the filmic representation of Vienna’s Prater district.